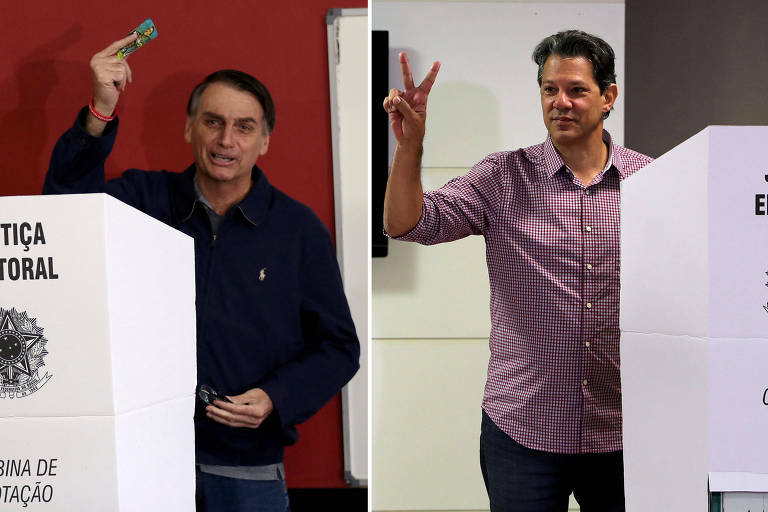 With nine days to the presidential election's runoff, representative Jair Bolsonaro (PSL) maintains a comfortable lead over his opponent Fernando Haddad (PT), according to a new Datafolha poll from Thursday (18th). The survey shows Bolsonaro with 59% of voting intentions, without counting voters who are still undecided or will cast blank or null ballots. Haddad, the former mayor of São Paulo, has 41%. The previous Datafolha poll conducted a week ago and three days after the first round showed Bolsonaro with 58% of voting intentions and Haddad with 42%. Datafolha interviewed 9,137 voters in 341 townships from Wednesday (17th) to Thursday. Folha and TV Globo commissioned the survey. The changes observed in the preferences for the candidates are within the survey's margin of error, which is two percentage points up or down. The poll shows that the return of the mandatory political broadcast on TV and radio had no effect on the numbers. Both candidates are using their time to attack their opponents (that is, each other), but they have the same amount of time to defend themselves -- something that didn't happen in the first round. Bolsonaro decided to avoid debates with Haddad. Alternatively, he is giving interviews in TV networks and communicating directly with his followers on social media. Share this "Vale Engineer Says that Company Leaders Knew the Risks of the Brumadinho Waste Disposal Dam"